Kurama Yama or Mt. Kurama (570 meters above sea level) is 12 kilometers due north of Kyoto Imperial Palace and can be reached in 30 minutes from Kyoto by car or train. The Kurama Temple, founded in 770 as the guardian of the northern quarter of the capital city (Heiankyo), is located halfway up the mountain. The original buildings, however, were repeatedly destroyed by fire. The Main Hall was last rebuilt in 1971. The temple formerly belonged to the Tendai sect of Buddhism, but since 1949, it has been included in the newly founded Kurama-Kokyo sect as its headquarters. More than six million years ago, Mao-son (the great king of the conquerors of evil and the spirit of the earth) descended upon Mt. Kurama from Venus, with the great mission of the salvation of mankind. Since then, Mao-son’s powerful spirit governing the development and the evolution not only of mankind but of all living things on Earth has been emanating from Mt. Kurama, and a priest named Gantei received the spiritual transmission. In the first year of Hoki (A.D. 770), Gantei, who was the best pupil of High priest Ganjin, the founder of the Toshodaiji Temple in Nara, led by a white horse, climbed up to this holy place. His soul was enlightened with the realization of Bishamon-ten (the protector of the northern quarter of the Buddhist heaven and the spirit of the sun). Following, he founded the Buddhist temple on Mt. Kurama. Later, in the 15th year of Enryaku (A.D. 796), the chief officer in charge of the construction of the Toji Temple, saw a vision of Senju-kannon (the thousand armed Kannon and the spirit of the moon) and built temples and pagodas on the mountain. Mao-son, Bishamon-ten, and Senju-kannon are the symbols of the universal soul, forming a Trinity known as “Sonten” or the “Supreme Deity”. Sonten is the “Living Soul”, the “Supreme Soul of the universe”, the “Glorious Light”, and the “Activity of the Soul”. These three are the symbols of power, light, and love. We worship Sonten as the composite of all three. “We trust in Sonten for all things.” Sonten is the creator of the universe, and cultivates the development of everything all over the earth. He rests deeps in our individual minds, and causes the “Great Self” or “Atman” to wake up within our hearts. He gives us new power and glorious light. 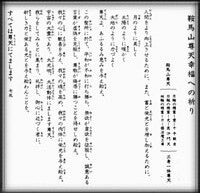 Seishonagon, an eminent female essayist, wrote an essay (A.D. 1,000) on Kurama. 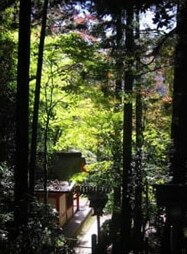 “The road to Kurama is a winding path; at a glance, the distance appears to be quite near, but it is quite far.” Now, however, if you take the cable car, it takes only three minutes to get to the upper terminal and then only a ten minute walk to the main hall of the temple. There, the sky is clear and serene, and the air is pure. Mt. Kurama is wonderful throughout the year. During the Heian and Kamakura Periods in particular, literature and the Buddhist arts flourished on the mountain. Kurama is also famous as a historical place. There is the interesting story, for instance, of the warrior called Ushiwaka-maru (later known as Minamoto Yoshitsune, 11,59-1189). When he was a young lad, he took military arts under the “Tengusan” (subjugator of evil) at Kurama, and he went on to become an excellent soldier. A number of historical sites connected with him still remain on the mountain. We lead our lives by virtue of Sonten. Sonten has bestowed his power on us so that we can lead a good life; casting evil out of our minds with the strength of his power. We make every effort to perfect ourselves. We trust in Sonten for all things. Sites of Historical Interest on Kurama Yama. 19. Stone Poetry Inscription by Tekkan and Akiko Yosano. Bestow your blessing upon us to uplift mankind and increase our riches and glory. and that respect may surmount insults. and fill our bodies with glory. a new strength and glorious light. We trust in Sonten for all things.